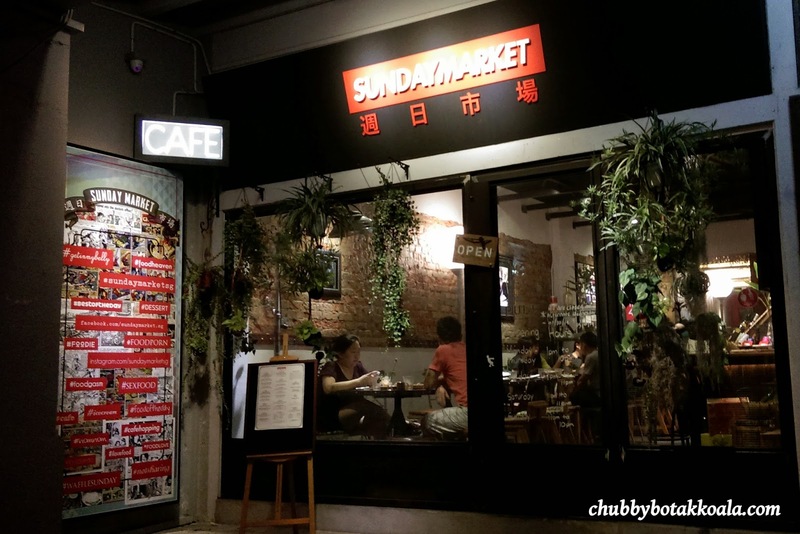 Chubby Botak Koala - Singapore Food Blog, Travel and Lifestyle: Sunday Market – Probably the Best Cafe for 2014!! I got to know about Sunday Market from Rubbish Eat Rubbish Grow review when I was looking for a brunch place. Since our first visit, Little Devil and I went back there three times in the past two months and we just can't get enough of the place and it is so near our place. Located at Lim Tua Tow Road, this area can be consider one of the foodie cluster, especially those shop houses facing Upper Serangoon Road. Luckily Sunday Market is located in the next block, where it is easier to get car park and there is valet available during certain nights. First impression, from the outside, it is quite funky. The signboard is a combination of red and white is more like a Chinese restaurant in Western countries instead of cafe. Once you are in, the décor is unique, minimalistic but making you feel like you are dining outdoor. The crowd just make it feels lively. Not sure why, but it seems to be in trend that lots of cafe like to hang oldies stuff such as bicycle, chair, TV, etc. from their ceiling. 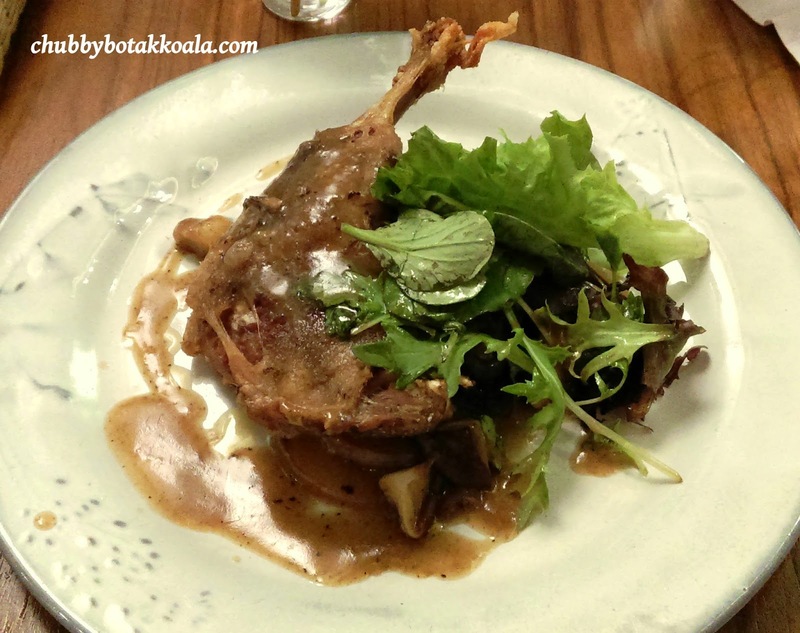 Crispy Duck Leg Confit ($17.90). Move over French Bistro, most newbies cafe in Singapore has mastered this dish. The same can be said here, nicely executed. The skin is crispy, the meat is tender, flavourful and not too salty. While duck confit supposed to be soak in duck fat during the marinating process, you don't feel the oiliness here. The potato is crisp, goes well with the brown sauce and salad. Pulled Duck Sandwich ($13.90). Another well executed duck dish here, the use brioche bread packs more flavour to the dish. It was pan fried at first, so it is crispy, and you can feel the crunchiness of the duck in the sandwich as well. The creamy slaw and brown sauce bind the whole sandwich together. Good for light bite. French Toast with BBQ Chicken ($12.90). This is a modern fusion dish with Thai twist. The grilled chicken is sweet, tender and succulent. Using the same brioche bread for French toast is the right choice. The fried egg is good and the sriracha sauce give a unique twist to the dish. Bangkok Toast ($10.90). One of the best desserts here with awesome presentations. The brioche is flavoured with cinnamon (very light) and icing sugar. 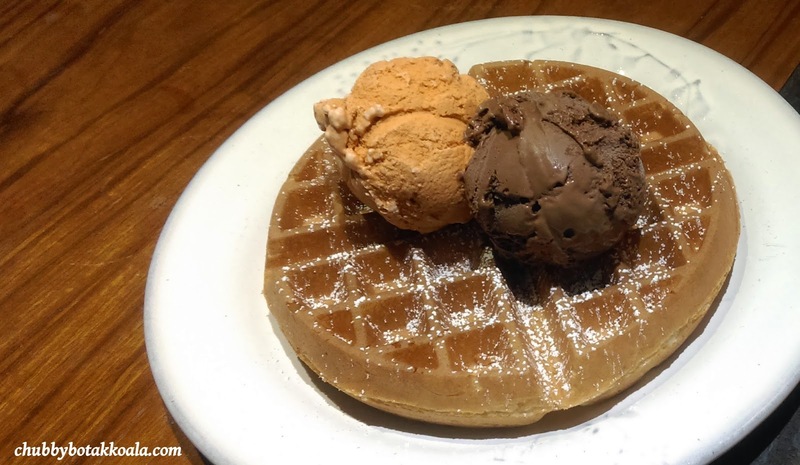 Green tea custard and Thai Milk tea ice cream are have a subtle hint of sweetness and very good to accompany the toast. Once the ice cream melts, it become a creamy milk shake. For drinks, the caffeine is very average. Don't expect those artisan coffee, as it is not their focus here. (Hint to management, Can we get better coffee??). I personally like their Lemmy Lemonade ($5.90). This lemonade is just refreshingly tangy. Imported from New Zealand, this drink is organic (not that I really care) and it just tasted awesome. Thai Milk tea is also a favourite but it can be a bit sweet if you don’t have a sweet tooth. Service is fast and friendly. After they took your order, they will provide you with the cutlery and the anticipation of getting your grub soon. From the way it looks, the utensils and cutleries are from Thailand. Overall, Sunday Market is going to be our cafe of choice in 2014. The food is excellent and value for money. We really enjoy the comfortable atmosphere here and best of all you don't need to wait for long to get a seat. Well, you definitely see us more often here. Cheers! !